The new Procurement Law and Regulations came into effect on 1 May 2018, making procurement across the public service fairer, more transparent and more accessible. 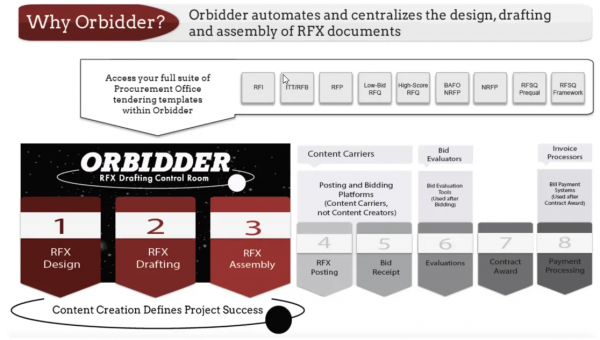 Orbidder is a leading next-generation competitive bidding platform that automates the design, drafting and assembly of tender documents. This unique RFx Drafting system is designed to help people involved in procurement to reach new heights in speed and precision when undertaking a procurement project. Many people have asked to learn more about this e-procurement tool and Julia Mills of Orbidder has been delivering online sessions along with Liz Gerrie from the Central Procurement Office. The webinars allowed you to register and attend from your own computer, completely free of charge. In just one session, regular users can fine-tune their motoring skills on the platform and new users will be introduced to many features of this important tool to make your procurements more efficient.